Warren Buffett is making a cool profit (on paper) on his $5 billion BofA bet. NEW YORK (CNNMoney) -- Warren Buffett earned $357 million in paper profits on Thursday simply on warrants related to his $5 billion equity infusion into Bank of America. Not bad for a day's work. In exchange for the Buffett brand name and $5 billion, the Charlotte, N.C. financial institution granted Warren Buffett the option to buy up to 700 million of its shares any time in the next 10 years for $7.14. Yesterday those warrants would've reaped the Omaha investor a nine-figure profit. Such paper profits could be ephemeral should Bank of America (BAC, Fortune 500)'s stock drop dramatically and stay there. For now, with the bank's stock trading at $7.67 by midmorning Friday, investors are betting that yet again Buffett correctly spotted a long-term safe haven for his and his investors' fortunes. During the financial crisis, Buffett famously refused to loan money to Lehman Brothers, yet gave Goldman Sachs (GS, Fortune 500) a similar stamp of approval with a $5 billion investment during the financial crisis. His bets were right: Lehman folded, and the Goldman Sachs investment reportedly generated a $3.7 billion profit for Berkshire Hathaway (BRKA, Fortune 500). "The question is whether Bank of America gave too many of those warrants away to get Warren Buffett to put the $5 billion preferred investment in the company. In the end that will be the question," says Marty Mosby, a managing director at Guggenheim Securities. 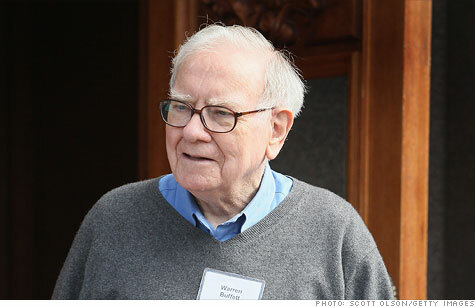 The warrants give Buffett the right to purchase up to 6.5% of the company's equity. As part of the Buffett investment, Bank of America will also pay the famed investor $300 million -- a 6% annual dividend or $821,000 a day -- for a decade, on his $5 billion in preferred shares. Buffett's dealmaking skills came into play in crafting the warrants on Bank of America, not the dividend, investors say. Compared to 10-year Treasuries, which currently yield 2.2% annually, investors say this dividend is commensurate with the riskiness of the stock and financial sector. By contrast, Goldman Sachs offered Buffett a 10% dividend on his 2008 investment. When the investment was announced Thursday, investors were quickly giddy on the news, sending shares up as high as 26% by midmorning. Exuberance subsided, but the stock still closed up 9.4% at $7.65. Has Warren Buffett just called the bank bottom?